The underglaze-blue painted waterpot in the Museum’s collection is a rare example of early blue-and-white pottery. The vessel’s hard grey-white body is sparely decorated with horizontal blue dashes and dots beneath a crackled transparent glaze. 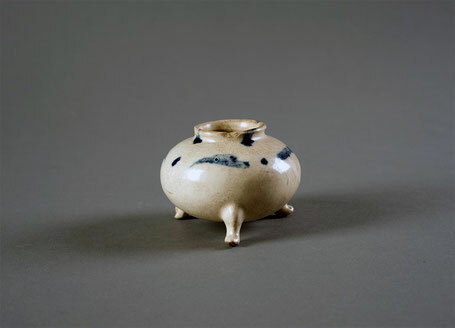 The shape of the pot, with a concave body, short neck and three feet, resembles that of typical Tang period (618–907) tripod vessels, and suggests its use as a scholar’s object. Although otherwise simple in form, the three feet have been moulded into the form of animal claws. The University Museum and Art Gallery (UMAG) of The University of Hong Kong is the oldest continuously operated museum in Hong Kong. 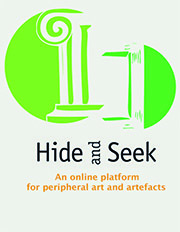 Its collections include over four thousand artworks representing the culture, styles and craftsmanship from Chinese antiquity to the present day. Highlights of the collection include Shang dynasty bronzes; Nestorian crosses; Neolithic potteries; Tang, Song, Yuan dynasties ceramics; Qing woodwork; as well as traditional and modern paintings and calligraphy. UMAG is a teaching institution with study collections exemplifying the history, material culture and artistic talents of China.